Want juicy and flavorful pulled pork that takes only one hour and two ingredients? I have you covered! All you need are two pounds of pork tenderloin and three cups of Puttanesca sauce from Terlato Kitchen. I received the sauce to taste test and loved that it had olives and capers and all the needed seasonings: no need for added salt of pepper for your pulled pork. I used my electric pressure cooker for this: add pork tenderloin to the pressure cooker, cover with Puttanesca sauce, set for 1 hour on meat setting. Once the pressure is released, carefully use two fork to pull the pork apart. This pulled pork is great for lunch, brunch or dinner. 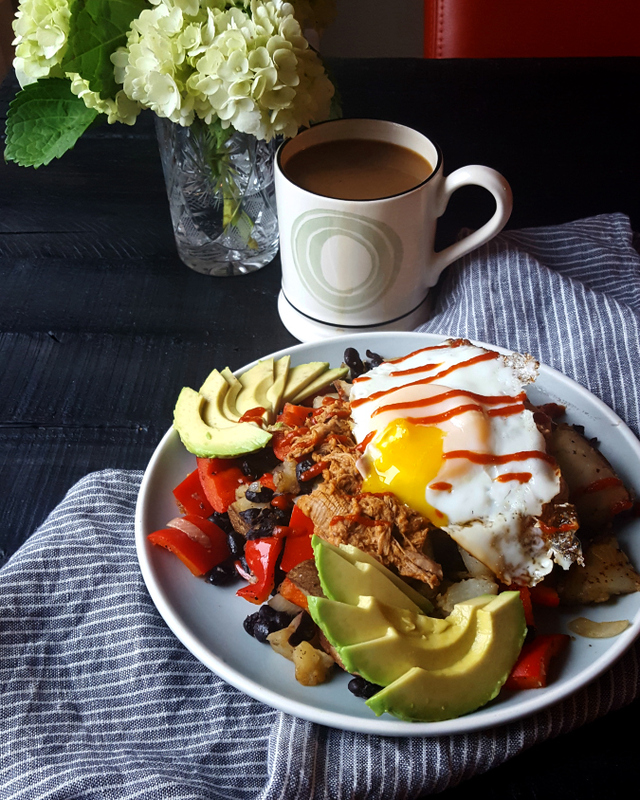 Last weekend I piled the pork on a mixture of potatoes, black beans, red peppers and onions and topped it with a fried egg and a side of avocado. So good! Disclosure: I received a few samples from Terlato Kitchen, but am not being monetarily compensated for this post. All opinions are my own.